The Cuisinart Blender Attachment expands on the great functions and features of four Cuisinart stand mixers, connecting to the high speed power outlet provided on each. The attachment fits models SM-55, SM-55BC, SM-70, and SM-70BC. 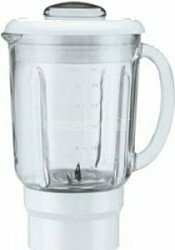 Not merely an attachment, it is a full size blender with a generous forty ounce glass jar. The unit offers twelve speeds and includes an ice crushing function. The leak resistant cover has a two ounce removable pour lid for adding ingredients as you blend. Instructions, a recipe book, and a three year limited warranty come with the item. Use your mixer plus blender to create milkshakes and smoothies, frozen drinks, or to mix sauces or batters. The glass jar won't scratch and mar like a plastic version. Because the blender attaches at the back end of the topmost portion of the stand mixer, the unit may have to be pulled out from under any overhanging cabinets. The blender does anything a normal blender can do, without requiring you to store yet another appliance. This is just one of a whole series of attachments available. Each one opens up a new realm of possibilities in food preparation and adds value to the Cuisinart line of stand mixers.